Remember Chernobyl? We thought we learned our lesson there, didn’t we? We thought, or at least hoped, that Chernobyl was a fluke, a once-in-a-lifetime event, or something that they deserved but would never happen to us, right? On April 12, Japan’s nuclear regulatory agency raised the categorization of Fukishima to Level 7. That category was created for Chernobyl yet experts do agree that Fukushima was many times worse. In a study for Greenpeace one noted scientist stated that the amount of unstable radiation released by Fukushima was the equivalent of 3 Chernobyls. Radiation measured in milk in Hawaii is now over 2,000% federal safety levels. In 14 US cities, increased radiation levels have been noted in municipal water supplies. Rainwater in every US state and Canadian province have higher radiation levels than prior to Fukushima. In California, atmospheric radioactivity levels have gone from 7.5 to 22.5 clicks a minute. On a more local level, a measurement of radioactivity of rainwater in San Franciso (the home of Hippies and ‘Flower Power’, remember?) were 18,000+ times federal safety standards. Back in Japan, the central government has ‘requested’ the Japan Meteorological Society and universities to stop releasing environmental radiation data so as to not scare the population (what you aren’t’ aware of can’t hurt you, right?). A world-wide network of radiation sensors set up after the Comprehensive Nuclear Test Ban Treaty of 1996 currently registers radiation levels, almost worldwide, at least equal to that of Chernobyl. One scientist said, “I’ve never seen data like this in my career”. In order to keep the public from getting worried, several countries, including Austria, Canada, Germany and Australia, have banned the episodes of ‘The Simpsons’ which were critical of the nuclear industry and their greed. Nothing like having a â€˜free press’, right? Several news agencies reported that the EU (European Union) simply changed, with any public disclosure or discussion, their own guidelines for food safety and raised the acceptable radiation limits to 20 times previous levels. (Gee what do they know that we don’t?). Their bylaws permit them to do such things in the case of a nuclear emergency! Radioactive seawater at 7.5 million times the safe limit has been found in the ocean nearby making Japanese coastal waters dirtier than any beach in New Jersey ever was. This dumping clearly violates 1972 International laws on the protection of the marine environment,. yet TEPCO still has over 60,000 tons of radioactive water they don’t know what to do with. Fish in Japan coastal waters now register quantities of Iodine 131over 4,000% of Codex Alimentarius limits and 447% of cesium 137 (even though Codex Alimentarius isn’t exactly a good thing for humanity either). Cesium has a half life of 30 years (meaning it’ll be around for about 6 centuries). Radioactive seaweed attributable has been found in Puget Sound. all the way across the Pacific. Kiss the whales goodbye! But don’t worry, TEPCO is doing the right thing for the locals. They offered to pay them $12 in compensation. For some reason, the local residents turned their kind offer down. Sadly, these facts are just the tip of the iceberg. Fukushima was really, really â€˜bad news’ and the common people will suffer the most. TEPCO is still considered a solvent company and the same government officials still have their jobs. Not only are the people in Japan suffering (whether they know it or not) but people in the US as well as other countries are feeling the direct consequences of this catastrophic nuclear disaster. 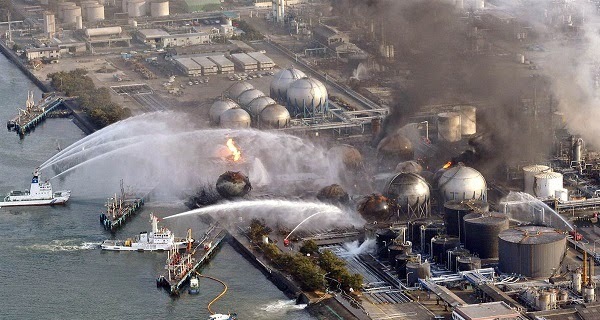 The true magnitude and consequences of the disaster are being covered up in order to protect the nuclear industry and governments from loss of power. What the people can expect from this increased exposure to radiation is malfunctioning in their immune system, thyroid disease, diabetes, asthma, hepatitis, multiple sclerosis, myalgic encephalomyelitis just to name a few of these precious gifts from the â€˜my’ generation. Some scientists have already declared northern Japan, including Tokyo, uninhabitable and recommended its evacuation. Radiation in Tokyo has been doubling every day since March 11. Actually, similar radiation levels exist in California and other western US states and some analysts critical of the present Obama administration speculate that this radiation danger could even by a factor if and when Obama declares martial lawâ€¦ i.e. he could say it’s in the public interest to herd everybody into those FEMA camps that everybody knows he’s already built. Needless to say, if the US public still has a chance, they need to do whatever it takes to ensure that alternatives to nuclear power are fully investigated. They’re there but it’s just politics that’s kept them from being developed. Meanwhile, cell phone radiation, itself a serious problem is still a factor for the US consumer to deal with. One technology for effectively dealing with it is the Aires Defender, made by a Canadian company called Aires Shield. The product is a special, high-tech film which adheres to the back of the cell phone. Within the multi-layered film is a microprocessor which neutralizes and dissipates the radiation the cell phone puts out. The product is available online and it really works. Don’t you wish there was something like that to protect us from Fukushima fallout?